I am the Office Manager for Dunes Dental 4 Kids. I have been working with Dr. Hemmingsen since August 1, 2001, when he opened his practice. When Dr. Howenstein joined the practice, that made our office even better. I truly love working at Dunes Dental 4 Kids! We have two great Doctors and a great staff that helps to comfort and support each patient and educate the parents. I have made so many friends from the parents that bring their children to our office. It has been such a joy watching them all grow up. When I’m not working, I enjoy spending time with my Grandchildren. They fill my heart with so much love. My hobbies include quilting, photography, flower gardening and anything else that might look fun on Pinterest! I’m a big fan of the Denver Broncos and the Chicago Cubs. Hi, my name is Nicole. I’ve been at Dunes Dental 4 Kids since 2007. There is not a day that goes by that I’m not thankful for my place here at Dunes Dental 4 Kids. I enjoy working with both the children and their parents. Outside of the office I enjoy spending time with my husband and daughter. Hi! 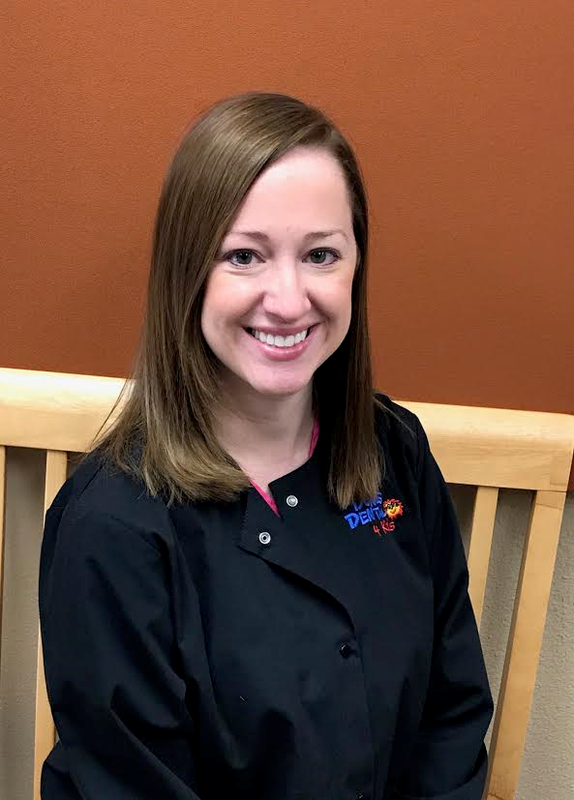 I'm Kristin, I first started working for Dunes Dental 4 Kids May 26, 2015. I left the following year to stay home with my newborn daughter. I just recently rejoined the team in March 2017 working Tuesdays and Wednesdays, and couldn't be happier. My husband and I have been blessed with 4 beautiful children that take up ALL of our time. In what spare time we do have, we enjoy doing projects and renovations to our home and having game nights with friends. My name is Sara. I graduated from Western Iowa Tech with my CDA in 2013. I have worked at Dunes Dental 4 Kids since May of 2013. I have two daughters and one son at home that I spend all of my time with outside of work. I love working with all the children that come to our office. The patients, my co-workers and both Doctors in the office make this the best place to work! Hi, my name is Hannah. I am newly married to my husband, Cody. We enjoy spending time with friends, family and being outdoors. I have been with Dunes Dental 4 Kids since November of 2015. I love working with all of the kids that come into our office; it truly is a great place to work! Hi! My name is Ashley. I received a Bachelor’s Degree in Dental Hygiene from the University of South Dakota in 2011. I have enjoyed working at Dunes Dental 4 Kids. I like reading, cooking and watching the Iowa Hawkeyes! Hi! I’m Amanda. I graduated from WITCC in May 2014 with my A.S. degree and diploma for Dental Assisting. I began working at Dunes Dental 4 Kids June, 2, 2014. It’s an absolute blessing and privilege to work with and beside these great Doctors and ladies here! I enjoy spending my free time with my husband (Rob) of 8 years and our 4 children. We enjoy playing volleyball year round, traveling, spending time with extended family and vacations to Florida. Hi, my name is Holly. I love being a dental hygienist at Dunes Dental 4 Kids. I started my dental career as a dental assistant in a pediatric office in the fall of 2000 in Reno, NV. I have always loved my time working with children and assisting in hospital settings, general offices, and endodontics, which I did until 2011. It has been my goal since I was 12 years old to become a dental hygienist. In 2011, my husband accepted a job as one of the practicing dentists at the Winnebago Tribe of Nebraska's IHS clinic and we moved from Las Vegas, NV to Sioux City in August of that year. We welcomed a son, our first child in December 2012. I decided to pursue a higher education from the University of South Dakota and graduated in 2016 with a Bachelor's degree in Dental Hygiene. I love spending time with my husband and son. We enjoy being outdoors, going on family bike rides, attending church, having dinner with friends, and it is always a highlight in our life when our family comes to visit us. I am excited to continue my career at Dunes Dental 4 Kids and give the best patient care to our great patients. Hi, my name is Elisa. I graduated from Western Iowa Tech in 2011. I am a Certified, Registered, Expanded function Dental Assistant. I've had the pleasure of working with Dunes Dental 4 Kids since February 2016. I enjoy working with kids; calming their fears and worries is so rewarding to me. I have a very spirited daughter whom is the love of my life. Whether we are traveling or watching our favorite movie Bolt, she makes my heart smile. Hi, my name is Eulalia, but I go by Kat. I started working here in the fall of 2017. I really enjoy working with children. I also enjoy being a part of the Dunes Dental 4 Kids team and spending my days with my great coworkers and the two nice doctors. Hi, my name is Melissa! I graduated in 2003 with my A.S. in Dental Assisting and my B.S. in 2012 in Health Studies. I started at Dunes Dental 4 Kids in June 2017 and it has been a joy to work here! I spend my spare time with my husband and two daughters. We enjoy watching sports and spending time outdoors.